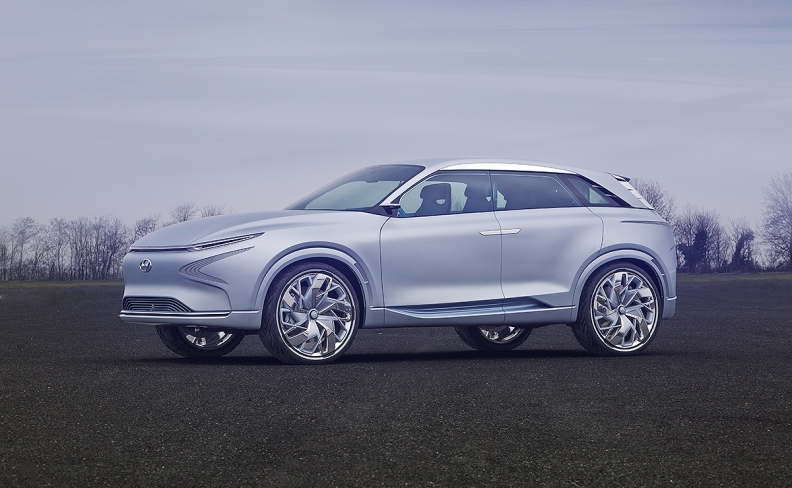 Hyundai presented the FE Fuel Cell concept at this year's Geneva auto show, but electric cars may ultimately take center stage for the automaker. SEOUL -- Hyundai Motor Co. says it will place electric vehicles at the center of its product strategy -- one that includes plans for a premium long-distance electric car as it seeks to catch up to rival automakers. Like Toyota Motor, Hyundai had initially championed fuel cell technology as the future of eco-friendly vehicles but has found itself shifting electric as Tesla shot to prominence and battery-powered cars have gained government backing in China. Toyota is now also working on longer distance, fast-charging electric vehicles, local media have reported. Hyundai plans to launch an electric sedan under its high-end Genesis brand in 2021 with a range of 500 km (310 miles) per charge. It will also introduce an electric version of its Kona small crossover with a range of 390 km (242 miles) in the first half of next year. The automaker and affiliate Kia Motors, which together rank fifth in global vehicle sales, said it would add three plug-in vehicles to its plans for eco-friendly cars, bringing the total to 31 models by 2020. To see the full product pipeline for Hyundai, Kia and Genesis, click here. Underscoring Hyundai's electric shift, those plans include eight battery-powered and two fuel-cell vehicles -- a contrast to its 2014 announcement for 22 models, of which only two were slated to be solely powered by batteriers. Hyundai also confirmed a Reuters report that it is developing its first dedicated electric vehicle platform, which will allow the company to produce multiple models with longer driving ranges. Last year, it launched its first mass-market full electric car, the Ioniq, but the vehicle's per-charge driving range is much shorter than offerings from Tesla and General Motors. Hyundai unveiled a near production version of its new fuel cell crossover with a driving range of more than 580 km (360 miles) per charge, compared with the 415 km (258 miles) for its current Tucson fuel cell SUV. The midsize crossover will be launched in Korea early next year, followed by U.S. and European markets. A fuel cell electric bus is slated to be unveiled late this year, while a sedan-type fuel cell car is also planned. Even so, analysts noted that gaining traction with fuel cells was going to be a long hard battle partly due to a lack of charging infrastructure. Hyundai launched the world's first mass-produced fuel cell vehicle in 2013, dubbed the Tucson Fuel Cell, but sales trailed Toyota's rival offering, the Mirai. Hyundai has sold about 862 units of the Tucson Fuel Cell since its 2013 launch, while Toyota sold some 3,700 Mirai fuel cell cars since its 2014 launch. In Korea, there are 10 fuel cell charging stations, only one-tenth of the 100 locations in Japan, Hyundai said.